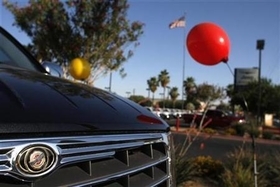 NEW YORK -- Even Chrysler's own executives thought bankruptcy for the automaker would mean liquidation. Instead, emergency surgery appears to have saved the patient, and sooner than many critics ever imagined. The sale of Chrysler's main business to Italy's Fiat S.p.A. and other groups will likely go off by the end of May, hitting the government's target to take the vast majority of the company out of bankruptcy within 30 days of its April 30 filing. In one of the most complex bankruptcies ever filed, there are a few possible sticking points that could hang up the sale. A group of Indiana pension funds filed suit in a separate court, for instance. Most specialists expect Judge Arthur Gonzalez to approve the sale after next Wednesday's hearing. Gonzalez has been instrumental in quickly parsing objections from retirees, disabled employees, parts suppliers and railroads, among others. "There is a clear path to the sale going through. And the court is really trying to help that along," said Carren Shulman, a partner in the bankruptcy practice at Sheppard Mullin. Under pressure from a large debt load and declining car demand, Chrysler crafted a deal to put most of its assets into a new company that would be sold to Fiat, a union-aligned trust, and the Canadian and U.S. governments. Some plants and real estate will remain in bankruptcy, possibly for years, to settle outstanding claims. The agreement between the buyers and sellers will likely be signed as soon as the judge issues his decision, which could be within one day of the hearing's end, according to one source with direct knowledge of the situation. The Fiat deal is an example of what is called a "363 sale" in the bankruptcy world, which is typically done in the first couple of months after a filing. In Chrysler's case, the sale sped through quickly because Chrysler showed that the 30-day timeline was critical to saving the business. Chrysler idled its plants the day after it filed for bankruptcy but is still spending billions of dollars a month to keep the plants open, even while they are not making cars, the source said. "In the absence of having someone like the government continue to put in money, you can see that the company would go into liquidation in just a few weeks," the source said. The sale is not clear yet. A group of Indiana pension funds asked the New York bankruptcy court to postpone the case until a separate court could rule on whether the government exceeded its authority in dealing with Chrysler. Gonzalez said no, but the funds then filed the request with a District Court, anyway. The District Court will hear the arguments on Tuesday. "I don't think their argument is that plausible, but that doesn't stop them from appealing and trying to get it stayed," said Stephen Lubben, a professor of law at Seton Hall Law School in Newark, New Jersey. "Getting a stay from bankruptcy court is an extreme long shot. They might have better odds in District Court." Creditors and suppliers are lining up to be heard at the Wednesday sale hearing, but their hopes of slowing or stopping the sale have been nearly extinguished. In the first week of bankruptcy, Gonzalez heard and overruled all the objections likely to come up at next week's hearing, attorneys in the case said. "The judge has accepted the premise that any interruption has the potential to really imperil the sale," said one attorney who filed objections in the case. "The judge has made up his mind to approve the sale. He's listening to objections, and overruling them," said the attorney, who asked not to be identified.